AAA Bond Rating - What Does It Mean? What does it mean if a bond has a AAA rating? 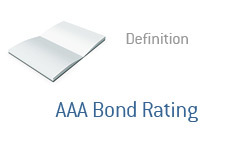 What is the definition of a AAA bond rating? All three provide credit ratings on different types of debt securities, ranging from corporate bonds to sovereign debt issues to everything in between. All three agencies have a scale on which they rate debt issues. For instance, at S&P, AAA is the highest credit rating, while "D" is the worst possible rating. The ratings affixed to each issue pertain to the offering's overall level of credit risk. If there is a higher potential for a default, then the rating will be lower. If there is little potential for a default, then the rating will be higher. A AAA rating, as you can probably guess, means that there is virtually zero chance of a default occurring. In the eyes of Moody's, S&P and Fitch, a AAA-rated bond offering is the safest possible place to put your money. Some examples of AAA-rated debt offerings? Debt issues from the United States. Sovereign bond offerings from Norway. Corporate bonds of certain blue chip companies, including Exxon Mobil and Johnson and Johnson. These are all AAA-rated offerings, and in the eyes of the three ratings agencies, there is virtually zero chance of a default in all three cases.